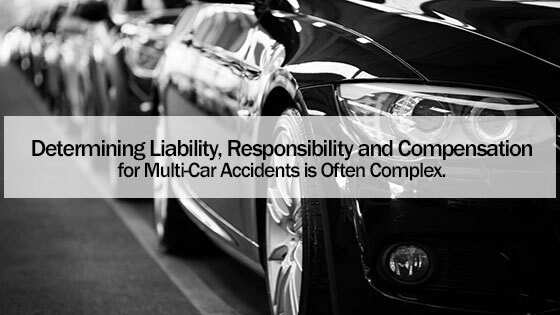 Home » Blog » Determining Liability, Responsibility and Compensation for Multi-Car Accidents is Often Complex. Find Out How a Car Accident Attorney can Help. Multi-car accidents are very complex because of multiple people and multiple insurance companies being involved. Who is responsible? How is compensation handled? What kind of liability will you be exposed to? These are all part of a multi-car accident case. The importance of having an experienced car accident attorney is vitally important to helping you navigate through this complex process. At the scene of the accident there is many things that occur. There is the initial reactions of anger and finger pointing. Then you may spend 40 minutes in a freewheeling discussion of all the details of your accident with three other drivers and a police officer before you consider your own financial, legal and criminal liability and also before you seek the advice and counsel of a qualified car accident attorney, you have just as much chance to volunteer for the blame as everyone else at the scene. If, on the other hand, you are minimally prepared and know what an attorney can do for you, the outcome might be altogether different. The first thing your car accident attorney will tell you at the scene of an incident is to keep your mouth shut. You’ll naturally do whatever the law requires with regard to identifying yourself and providing the necessary insurance information to the other drivers and police. However, when it comes to the details of the accident, you’ll be told to keep quiet. Your attorney will remind you that you face both civil and criminal liability at the scene of an accident, and that answering questions or offering theories about what may or may not have happened can easily implicate you in far greater problems than you may or may not face. This alone can save you financially and legally and help you preserve your hard won driving record. If there are more than two drivers involved in the accident, it is likely there may be prolonged negotiations with potential plaintiffs and defendants and their insurance companies. These are activities you aren’t likely to find entertaining, even if you’re a trial attorney. That’s one reason among many you will want to leave negotiations to an experienced advocate. Liability for an accident is only occasionally determined by the cold, rational interpretation of the facts and evidence at the scene. Far more often it is determined by pre-trial maneuvers around legal threats, bluffs, power plays and all kinds of other nonsense. Now imagine fielding all of this while you’re trying to work and get your car repaired. It’s not worth it, even if you think you’re not at fault. Chief among your priorities after any car accident is protecting yourself. Most people aren’t prepared for the fact their insurance company can go from ally to enemy at the speed of e-mail. It is far better in the long run to allow someone with expert-level knowledge of your state’s insurance code and a full understanding of the nature of the average insurance company’s agenda to do the negotiating when it comes to what happened and how your claim should be handled. If you try this on your own, you will get a first-class education in the insurance business model, which unfortunately doesn’t include frequently approved claims and big checks being stuffed into envelopes. Your insurance company is highly motivated to deny your claim, and if you inadvertently give them a reason, they will do just that. A car accident attorney will help you protect yourself in ways you likely aren’t aware of. Take advantage of that and put yourself first. You can be certain nobody else will.